If you are a die hard fan of Google Earth Pro, then today’s freebie news will make your day. 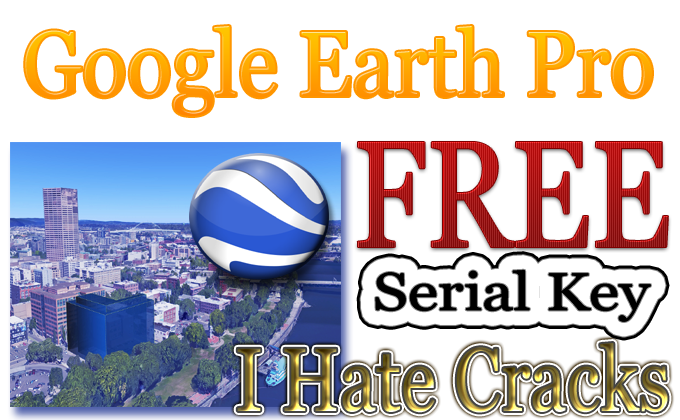 You no more need to use Google Earth Pro crack or illegal Google Earth Pro serial, if you can’t afford to buy it or don’t want to shell out quite a bit of money from your bank. Google gives away Google Earth Professional to Mac and Microsoft Windows and if you are interested then you can save $399/year. Respected readers, Let’s have a quick on its features. You might be thinking, If Google earth is free to use then why using it? You are right, but on one hand, Google Earth makes things easier. and on the other hand, you will find more useful features than Google Earth(simple). This geospatia program has the ability to display 3D interactive globe, through which we can access to world-wide imagery, and a large number of location-based layers. Mac and Windows users can learn and examine about anywhere on the earth. Where they can accomplish their need as type in the area. Install Google Earth Pro and discover your required places more thoroughly for example, urban areas, creep precise structures, schools, points of concern, the sky and much more. As well as, it enables you to examine the moon, sea, moors, and standpoint 3D models with ease and peace of mind. And now a bit about my favorite features of Google earth Pro version, you can preview the satellite image, region, maps, 3D structures, universe in the space. You can learn more on the Homepage. As I mentioned earlier, Google Earth costs you Pro$399/year. But according to the official Google Map blog, you can use it for free. No crack, no illegal license key, Google Earth Pro torrent or anything else. All you need to do is here you go and submit your name, email address and other information to get a free license key and installation instruction in your mailbox.